Most people think of a love token as a small gift or gesture that expresses affection for someone we care about. In actuality, a Love Token is a coin that’s been rubbed smooth and hand engraved with initials, names or sayings. These coins were given as gifts until the early twentieth century and were symbols of promise or remembrance. So, how did this practice start? For centuries, coins have been carried for luck. Unfortunately, it was easy to confuse your lucky coin with any other coin in your purse and people would accidentally spend them. In Great Britain it became common to mark your lucky coin to prevent that from happening by bending it twice, one side up and the other side down. These coins were known as benders and this is where the term a crooked sixpence came from. During the late seventeenth century people also began to engrave their lucky coins. These coins were appropriately referred to as engraved coins and many of them had simple linear designs. In addition to marking lucky coins, people also began to engrave coins to mark births, deaths, unions and marriages. 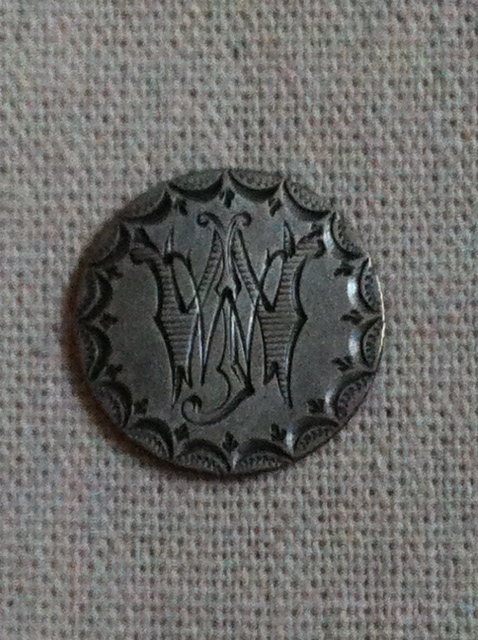 It’s believed that during the late Georgian era suitors began to present engraved coins to young ladies as tokens of love. By the early nineteenth century the custom of presenting “Love Tokens” made its way to the United States. To create a Love Token a person would take their coin to a jeweler or engraver who would smooth out one, and sometimes both, sides of the coin. The coin would then be re-engraved by hand with the initials of the giver, names, an important date, place or event. They were usually given as an expression of love and sometimes were used in the proposal of marriage. Keep in mind coins were worth a lot more in those days, so destroying your currency for someone you loved was a way to show how much they meant to you. 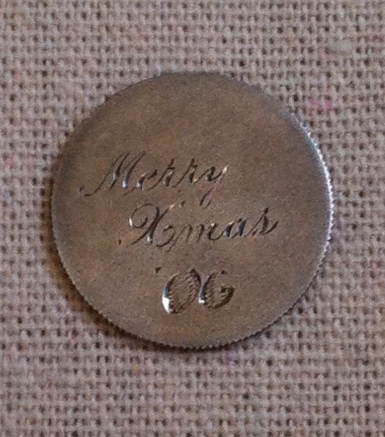 In the later half of the nineteenth century, Love Tokens were also given as gifts to family members as well as friends. 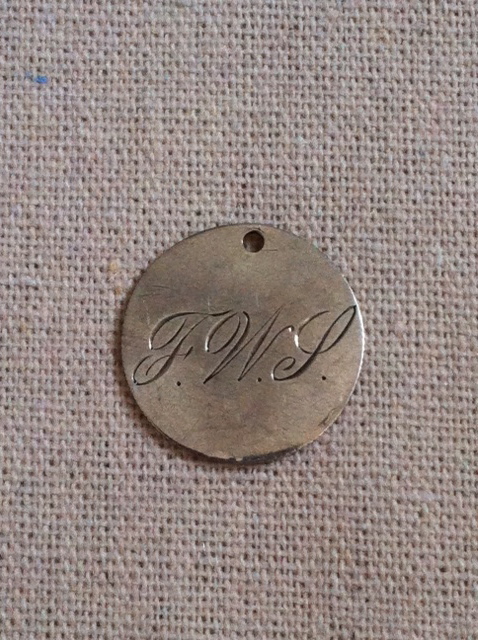 Some Love Tokens have holes in them so the recipient could wear the token around her neck or on her wrist. At the beginning of the twentieth century, the United States Government outlawed the practice of engraving coins and the custom of exchanging Love Tokens went out of style in America. I currently have four Love Tokens in my collection. Unfortunately the oldest one I own, which is from 1823, does not photograph well since the engraving of the initials “MJB” is a bit worn down. I like to believe the engraving’s worn because the lady who owned it rubbed it each and every time she thought of her one true love. I’m glad you liked the post. I love uncovering these historical tidbits! Like you, I am thinking of using love tokens in a future story. The potential is just too fun to pass up. This is so romantic! Thank you for the history lesson! I first discovered these tokens in a small antique shop in one of my favorite towns and thought they were so sweet. Glad you liked the post. I had no idea that love tokens came from coins. And how romantic! Thank you for sharing.